The software with the lowest cost benefit ratio for generating SDTM/SEND datasets and define.xml! The SDTM-ETLTM software is considered to be the lowest cost - highest benefit software for creating SDTM and SEND datasets in the industry. 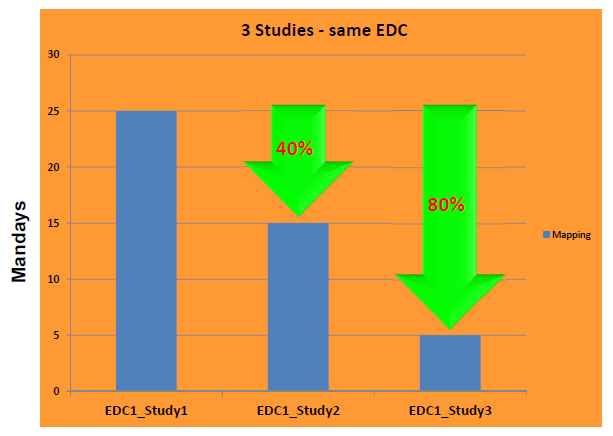 All that is required is that your EDC system can export clinical data in CDISC ODM format (most EDC systems do so). SDTM-ETL is completely "SAS®-free", i.e. unlike other solutions, you do not need an (expensive) SAS® license, nor do you need any statistical software. SDTM-ETL allows you to reuse mappings from other studies, leading to mapping development times of just a few days only for new studies. SDTM-ETL comes with an extremely user-friendly graphical user interface, allowing to create most of the mappings by drag-and-drop or per mouseclick. At the same time, your define.xml (1.0 or 2.0) is generated automatically - details are to provided using intelligent wizards (no XML editing nor user-unfriendly Excel worksheets necessary). Many CROs and service providers have already discovered SDTM-ETL and are using it for preparing their submissions to the regulatory authorities. SDTM-ETL v.3.2 has full support for as well define.xml 2.0 as for SDTM 1.4 (SDTM-IG 3.2) and for the new SEND-IG 3.1. Please notice that these manuals are constantly being improved and extended, so the contents can always change without special notice. Setting up and executing a mapping between your clinical data and the CDISC SDTM Standard is not an easy task. For some SDTM Variables, a 1:1 mapping is possible, but usually, clinical data items need to be combined to come to an SDTM Variable (n:1 mapping). Furthermore, codelists need to be mapped, and clinical data categorized to SDTM codelists. At the same time, the define.xml file needs to be constructed and kept in sync with the designed mapping. Furthermore, the mapping needs to be executed on the available clinical data and an SDTM database created and populated. Unfortunately, until now there was no software package on the market which could do this all at the same time in a user-friendly way. 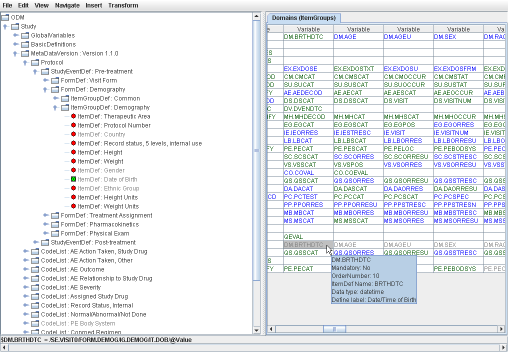 Therefore, XML4Pharma developed SDTM-ETLTM, a visual, easy to use software package for setting up mappings (and executing them) between clinical data in your operational database and the SDTM or SEND standard, at the same time generating the define.xml in the background. Define.xml (1.0 or 2.0) details can then be added using intelligent wizards (no user-unfriendly Excel files necessary). The SDTM-ETLTM software is the further development of the "SDTMWandler" ("SDTM Transformer") a software package developed for, and in close cooperation with TMF e.V. ("Telematikplattform f�r Medizinische Forschungsnetze e.V. "), the German Informatics/Telecommunication Platform for Medical Research Networks. TMV e.V. wanted a software package to transform ODM metadata and clinical data into SDTM format, this in order to build databases and data warehouses, needed to be able to compare clinical studies of the different partners in the academic network. 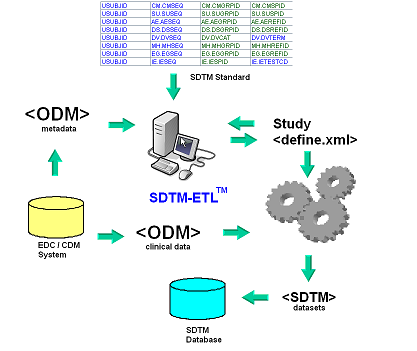 SDTM-ETLTM acts on CDISC ODM files (v.1.2, 1.3 or 1.3.1) which can easily be exported from any modern EDC, CDM system or database (the CDISC ODM standard is THE exchange format for clinical data between sponsors, CROs and the FDA). In SDTM-ETLTM, the clinical data metadata are represented as a tree on the left side of the screen, whereas the SDTM standard is represented as a table on the right side of the screen. Mappings can be created simply by drag-and-drop, wizards showing up automatically, making the mapping process very intuitive and easy. The mappings are then stored in an easy-to-learn scripting language within the underlying define.xml itself. This underlying define.xml is updated "on the fly", and kept in sync with all the additions and changes that are made during the mapping. SDTM-ETLTM is a real ETL tool - but specializing in SDTM. Once a mapping generated, clinical data can be extracted from ODM files, transformed into SDTM records, and loaded into the created SDTM database. As such, SDTM-ETLTM, together with our Study Designer and our other product offerings, is one of the first real realizations of CDISC end-to-end. More product information is available in the product flyer, and in the product brochure. A set of instruction movies is available on our demo application server. This set of instruction movies is regularly extended and improved. So we invite you to visit the 'instruction movies' website regularly. Although the use of the SDTM-ETL software is very intuitive, many of our customers desire to get some training to start working with the software. In our experience, one day of training usually suffices to make a jumpstart with the software. Such trainings are of course offered by us, usually at the location of the customer. A copy of the tutorial, explaining many of the features of the software, and used during trainings, is available on request. The SDTM-ETL software is available at highly competitive prices. A perpetual license costs considerably less than the SAS basic windows Analytics package first year license. Considerably volume discounts can be obtained. Academic licenses are available at a reduced price. For more information about licensing options and pricing, please contact us. The SDTM-ETL software uses CDISC ODM as the source as this is the worldwide standard for exchange and archival of clinical data: all modern EDC systems allow to export CDISC ODM metadata and clinical data. In the seldom case that your data capture system does not export to ODM, one can always start from CSV (comma-separated-value) data and transform these to ODM using our "ODM Generator" software. The latter allows to generate ODM from any "text based" data using any kind of delimiter between the fields. This is also the best tool when your clinical study data is kept in Excel or any other worksheet files (as is done by a number of our customers). 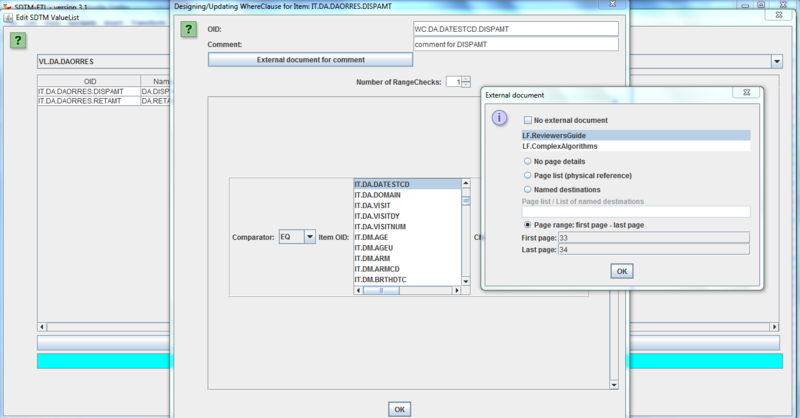 In case you receive your captured data as SAS files, you can also use the free SAS Clinical Standards Toolkit" to convert your data to CDISC ODM. OpenClinica® is a trademark of Akaza Research LLC in the United States and other countries. XML4Pharma is not a certified partner, reseller, or affiliate of Akaza Research LLC, and is not certified, approved, or sponsored by Akaza Research LLC in connection with the installation, operation, maintenance or support of the OpenClinica® software platform, the OpenClinica® Enterprise software platform or any other Akaza products.